Encourage your students to do their best each day during state testing with one of these special notes. Start the day off with a sweet treat and a positive note to set the tone for the day. 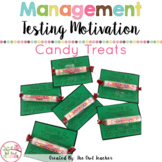 State Testing Motivation Candy Treat Tag You're No Dum-Dum! You're a Smartie! This is a word file for a star treat tag. There is space at the top to tape down a starburst! I use these during exam week to give my kids a little energy boost. There is one for each color candy. Hope your kiddos love them too! 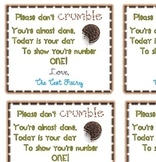 Treat Cards or Tags for attaching to candies! Download, print, cut and encourage before a test or assessment! I love giving treats of encouragement! I love giving treats before major assessments or tests! This treat bag tag can be used with multi-colored candy like jelly beans to sweeten your students day and encourage them to do their very best! This can be used across grade level or subject area! Just print and treat! 6 tags per page.